An instance is simply an image in an Animation Layer, an image whose duration can be adjusted. Each instance in the timeline has now two small squares which allows to use this feature. The one at the bottom on the right is for stretching the duration of the current instance. To do so, simply click on this little handle (it becomes green) and move it as shown opposite. If you pull on the left, your instance will decrease to the head's instance (the first image). You will notice another square on your instances, on the left at the top, this time. 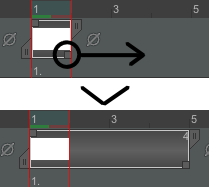 This handle allows you to stretch an instance without modifying the total duration of your animation. Opposite, we have an Instance containing three Cells. The first cell is called Head Cell or more simply : Head. The following cells (when existing) are called Exposure Cells or Exposures. The tail of our instance is the little handle ending the Instance which you can drag to adjust the number of Exposure Cells. Above the Head, you will find a handle, named the Sprocket. The sprocket allows you to adjust the number of exposure cells without change the global timing of the layer (except for the first instance of the layer). The number of cells in an instance is displayed on the top right corner of the Instance. Whatever the size of the instance could be, the exposure cells are an accurate reproduction of the head cell. At the first sight, all the cells of the instance have then the same content. - If the Auto break instance option is activated (it will be detailed in the next part), then the instance will be split in two. - However, if the Auto break instance option is not activated, the instance's head will be modified.